Every kitchen has a hand mixer. Let’s have a look at what the KitchenAid KHM9PWH 9-Speed Professional hand mixer has to offer and what makes it different from other makes and models. 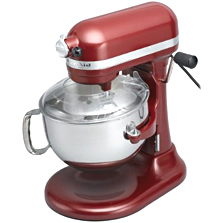 The KitchenAid K45SS Classic stand mixer is not a path breaker in terms of style or design. It looks exactly like what it is – a dependable reliable and rugged stand mixer that will give you years of service and make your baking (and other kitchen work) much easier. 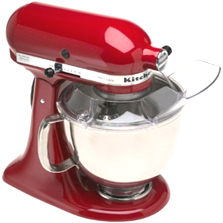 KitchenAid Artisan 5-Quart stand mixer is a rugged kitchen machine, and has a 325-watt motor. You can depend on the solid, durable, full-metal construction for all your cooking and baking needs for years to come. Stand mixer buying tips. Special features of stand mixers. Advantages and disadvantages of stand kitchen mixers in comparison with hand mixers. Stand mixer accessories. 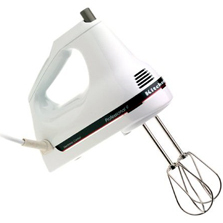 Hand mixer buying tips. Special features of hand mixers. Advantages and disadvantages of hand kitchen mixers in comparison with stand mixers. Hand mixer accessories. The Professional 600 Series stand mixer from KitchenAid is a kitchen machine that is more than a match for all your rugged kitchen mixing tasks. 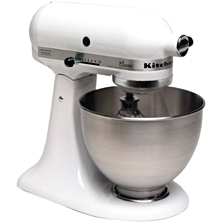 This all-metal stand mixer is equipped with a 575 watts motor, making it the most powerful mixing equipment by KitchenAid.